The Court of Appeal today deferred for Friday (31) to consider for granting of permission to file an appeal in the Supreme Court against the conviction and the sentence of Ven. Gnanasara Thera by the Court of Appeal on August 8. The Bench comprised Justices P. Padman Surasena (President/CA) and Arjuna Obeysekera. The Court of Appeal on August 8 in its judgment found guilty of all four counts of charges on the alleged offence of Contempt of Court against Ven. 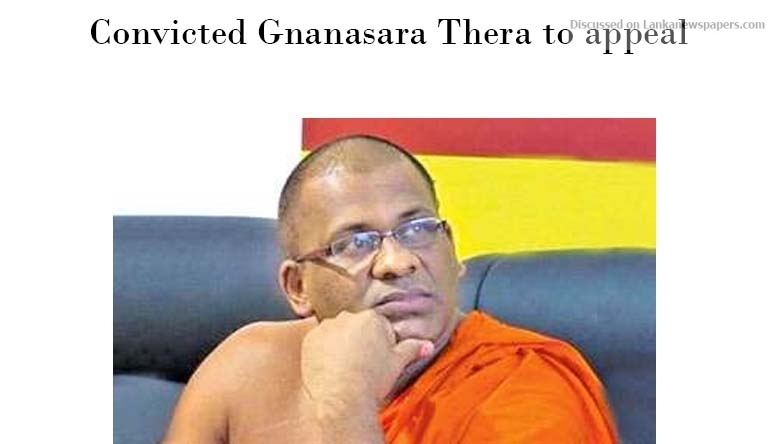 Gnanasara Thera and sentenced him on all four counts totalling 19 years Rigorous Imprisonment, but ruled that these sentences run concurrently resulting only six years Rigorous Imprisonment. The judgment was delivered by Justice P. Padman Surasena (President/CA) with Justice Shiran Gunaratne concurring. The Court had noted that all the charges had been proved and he was guilty of all counts of charges. The Court was of the opinion that the Accused Respondent had made the utterances deliberately and that he stood up and addressed demanding the release of an Accused Intelligence Officer, who had been remanded before. The Court sentenced him four years Rigorous Imprisonment each for the first two counts and six years and five years for other two Counts, totalling 19 years Rigorous Imprisonment. The CA had also directed these sentences to run concurrently resulting in six years Rigorous Imprisonment. On August 8, the Accused Respondent Ven. Gnanasara Thera was not present in Court. Manohara de Silva PC appeared for him told the Court that the Respondent got him admitted to the Sri Jayewardenepura General Hospital on August 6, as he developed a pain in the stomach probably from a kidney trouble. He also told Court that he might be undergone surgery in one or two days if diagnosed. The Court had issued an order to the Superintendent of the Prison of Welikada to take charge of the Accused Respondent forthwith and after the recovery take for the implementation of the sentence imposed on him. Counsel Manohara de Silva in the instance moved Court for time to consider the oral application for permission to appeal.